Five Star Awards & More 206 6th St.
Hy-Vee South Sioux City, Ne. Providing Dry Cleaning & Laundering Services At Their Professional Best! Bush Cleaners is within or close to, your neighborhood. Select from '7+' Locations for your convenience. Find them on the navigation bar above. It will take you to a mini-website that was designed for ease of navigation. That's the easiest way to acquire professional Dry Cleaning and Laundering services. The Green Clean process at Bush Cleaners is environmentally friendly. Several years ago, Bush Dry Cleaners replaced the old outmoded dry cleaning systems with updated and modern green cleaning. Our Bush Green Clean process is truly environmentally friendly and is very kind to your clothing. At Bush all of our cleaning processes are administered by trained industry professionals. Your delicate fabrics are safe with Bush Cleaners TLC. The cleaning team at Bush provides knowledgable care for fabrics of all types. Because of their expertise and efficiency less time is required to process each cleaning order. That time saved provides a lower cleaning cost for you! gentle life preserving Green Clean Care. 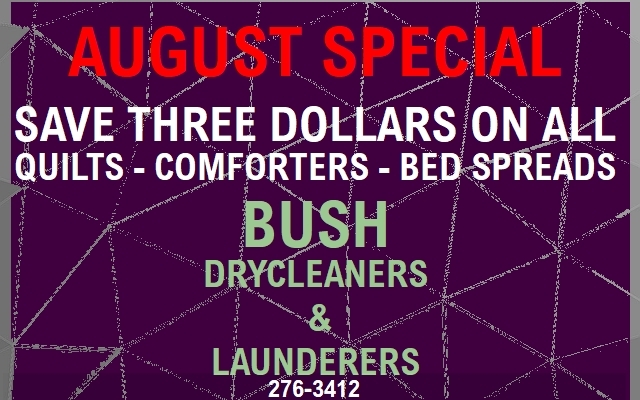 Bush Cleaners offers FREE pick-up and delivery for any two lbs. of laundry. They will give it their TLC washing process. BUSH will wash it, dry it, fold it, wrap it, and deliver it back at... No Extra Charge! All of this convenience for only $3.30/lb. Consider for a moment the cost of water, detergent, bleach, gasoline, wear and tear on your home laundry equipment plus... time and energy expended. The complete laundry services at Bush represent intelligent savings for busy, thrifty household managers. Send your laundry out with your items for dry cleaning. Bush will do it all and deliver it back to you for no extra charge! Total time saving convenience is yours. Call today and have us set up a regular pickup/delivery schedule for you.